24-Hour Concierge screens visitors and announces their arrival. Health Spas are equipped with whirlpool and sauna, universal free weights, treadmill and stationary bikes. 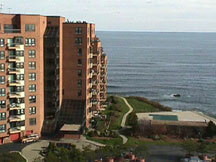 Residents of Seal Harbor III also enjoy a glass-covered lap pool. Rooftop Function Rooms with spectacular views from Beverly to Boston. Oceanside Pool areas include whirlpools, cabanas, grills and full kitchens. Tennis Courts always well maintained. Jogging and Walking Paths on meticulously manicured grounds. Private Balconies or decks overlooking the ocean. Deeded Indoor Parking. The underground garages have a key pad entry system. Master TV Antenna and cable connections in all units. Pre-wired Telephone Lines are capable of computer and modem hook-up.